Online video is the fastest-growing content medium for corporate marketers. A recent survey showed that around 70% of B2B marketers are using video within their promotional mix, while a similar number believe that video marketing converts better than any other medium. It’s no surprise that investment in online video continues to increase. But producing great video is not cheap and it’s not easy. So how do you make sure your investment works and your videos attract, engage and cultivate customers? The first job is to get noticed. With so much video marketing out there, attracting eyeballs is a major challenge. Marketers are naturally creative people, but sometimes that creativity can be suppressed by the corporate culture. But playing safe will only cost you viewing figures. The answer? Don’t be afraid to be different – within the bounds of your brand guidelines, cut through the noise with experimentation. The best approach is to adopt the ‘fail-fast’ methodology. Try something different – and be prepared to fail fast. Wow your audience if it works, and if it doesn’t, move on quickly and try again. The key to good video is good storytelling. Today’s marketing is a science – relying on data to make marketing decisions, but the best marketing is emotive and appeals to the human subconscious. Consumers don’t want to be blitzed with information about products and services – they want to be entertained and engaged. People gravitate towards the brands that they connect with emotionally. It’s therefore time to think ‘outside-in’ rather than ‘inside-out’ to develop strong, human stories that can attract new customers to your brand. A video is a window into your organisation – so make sure that when people peer through it, you’ve put the very best on display. Ultimately, people buy from people. It therefore pays to cast well. Getting your best internal advocates and experts on video is really important. If you’ve got a charismatic leader fronting your organisation or an eminent expert advocating your brand, use them. Audiences are quick to form opinions as they watch content, so simply getting the right people in front of the camera can give you a head start in the battle to build relationships. Video marketing requires skills that may not currently sit within your organisation. Don’t be afraid to look outside. Businesses could learn a huge amount from the broadcast industry, and they could also find a rich pool of talent is sitting there waiting to be snapped up. The broadcast industry is a cut-throat environment where work is often conducted on a project basis. It’s full of highly talented people fighting for work, many of whom suffer long gaps between engagements. For some, the prospect of a secure income, constant employment and the chance to bring new skills into an organisation could be very alluring. Always be on the lookout for talent – it could give your video marketing what it needs to stand out. And finally, once you’ve developed your content, make sure everyone can get to it. It’s too easy for great video to remain locked in the vaults of departmental silos. Moving huge video files around large global organisations can be difficult – but the best videos need to be seen, shared and maximised. To fail here is to waste precious investment and squander ROI. 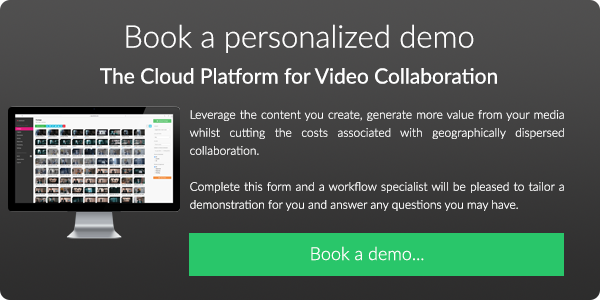 To make sure you get the biggest bang for your buck, cloud-based collaboration tools that allow you to scale your video operations and increase your content cadence are a must.